The man sighed deeply. He had been sitting at the gate, the entrance into the city, for several hours watching, waiting, conducting business. But now, it was time to go; evening was upon him and the streets of Sodom were not safe after sun down. Turning for one last look at the wide open plain beyond the outer gates he was startled. Seemingly out of nowhere, two figures approached the city. Judging by the way they were dressed they were definitely men. Having strangers pass through the city was not unusual, being as the city was a major trading hub. However, these men had no caravan nor did they appear to have any supplies with them other than the clothes on their backs. Seeing that he would not take no for an answer, the strangers accepted Lot’s kind offer and followed him as he led them to his home. True to his word, the strangers were made to feel most welcome. This was shown by the fuss made over them by Lot’s wife and two daughters as they scurried about the kitchen area baking the evening meal. When dinner was finally ready, it was truly a feast. The strangers surely ate beyond the point of being satisfied. As the night wore on the strangers prepared to settle down for sleep. Sleeping mats were laid out for them. Suddenly, a loud commotion broke the calm. Running to the door, Lot saw that a mob of men, young and old, had surrounded the house. 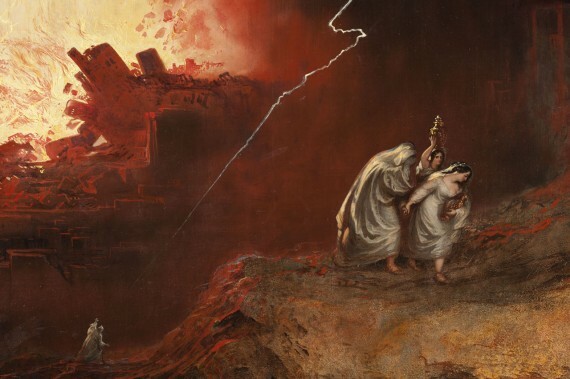 They were all residents of Sodom, many of whom Lot recognized from his daily activities. Although the voices were many, the cry was of one accord. With a quick glance at his two guests, Lot hurriedly stepped outside closing the door behind him. Although he was gripped by intense fear, the risk to his personal welfare outweighed the certain torture awaiting the two men. He knew this group and knew of their intentions; the strangers would not survive the night. Raising his hands to quiet the angry mob, Lot pleaded with them, bargained with them, and even offered his virgin daughters to them if they would just let the strangers be. “See now, I have two daughters who have not known a man; please, let me bring them out to you, and you may do to them as you wish; only do nothing to these men, since this is the reason they have come under the shadow of my roof.” His words fell to the ground, empty. “Stand back!” The leader of the mob shouted. “You came to this city to stay but you keep acting as a judge. Now, we will do worse to you then we would have done with those men.” Like a pack of wild animals, the whole of the mob howled their agreement. There are many nuggets that can be taken from this Biblical account of Lot, but I would like to focus on just one. If you read the Genesis account of Lot, you will see that he made some horrible choices in life. From the time he left Abraham’s side to the moment when the angels came to remove him from Sodom, he made one poor choice after another. The last of the account has him getting so drunk that he passes out and unknowingly has relations with both his daughters to become the father of his own grandchildren. Taking that into account, would it surprise you to learn that God considered Lot to be a righteous man who was tormented by what he saw and heard day in and day out (2 Peter 2:8)? Lot was righteous because he, like Abraham, believed God. It had nothing to do with his right decisions outweighing his wrong decisions. I wrote all that to caution you. Too many Christian’s are being caught up in the Social Media frenzy of bashing fellow believers because of poor choices made by the person. Yes, many brothers and sisters have strayed. To that there is no doubt. However, to jump on the “Bashing” wagon because of a small blip of information that may or may not be taking out of context is the equivalent of sin comparison. “Their sins are greater than mine. Therefore, I’m justified to judge them.” That is a dangerous attitude to have. One day that attitude will come back to bite you. Be blessed.